One of the many, many games I enjoy is Dominion, a deck-building game. 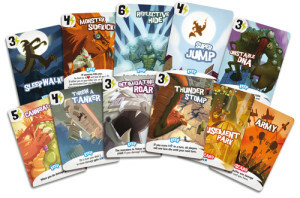 In the game all the players start off with the same set of cards, with which they use to buy cards from a common supply to add to their deck. As their deck grows, interesting combinations can be made from playing cards that have effects that feed off of each other. Eventually, one of the scoring card stacks in the common supply (or three of the other stacks) will be depleted and whomever has the highest total of victory cards in their deck wins. Dominion was originally published in 2008. 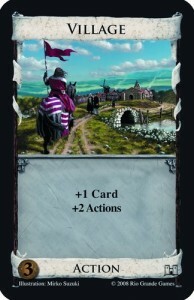 A typical card, Village, appears to the right. It’s a nice little card: a decorative frame that can be color-coded to the card type. Here, it’s an Action card, as shown near the bottom. On either side is the cost for the card and a symbol for the game set. (That’s that castle graphic.) On that slate is what this card does when played: draw one card and play up to two more actions. There’s also a black frame around the card. Me? I like card games that have art that bleeds off the edge of the card. King of Tokyo looks great. The Lord of the Rings‘ hero, enemy, and ally cards (Living Card Game) also are fantastic. Why not go for a look like that with Dominion? So here, a design doodle for reimagining the Dominion cards. During play, cards are typically fanned out in hand, but the information for what cards do is found in the text area. In order to find out what a card does, you have to actually look at the whole card in your hand. By incorporating icons in the upper left corner, when a hand of five cards is fanned out, a player can get an idea of each card’s effects. For Grain Mill, the card can allow the player to gain two coins and one card. The text of Grain Mill has the player gaining the two coins when the card is played. Additionally, if no other Action card has been played, the player can gain one card. Forest Path is a Reaction card, so we’ve got the blue color coding from the existing game to reinforce this. Forest Path also has a bit of text (it’s taken mostly from Horse Traders). All Reaction cards seem to begin When another player plays an Attack card… We can get rid of all that text by using a Reaction keyword. I’d like to remove the Reaction keyword from the card type bar below and just use the keyword as the indicator, but there are probably some cards in the various expansions that refer to a Reaction card type. 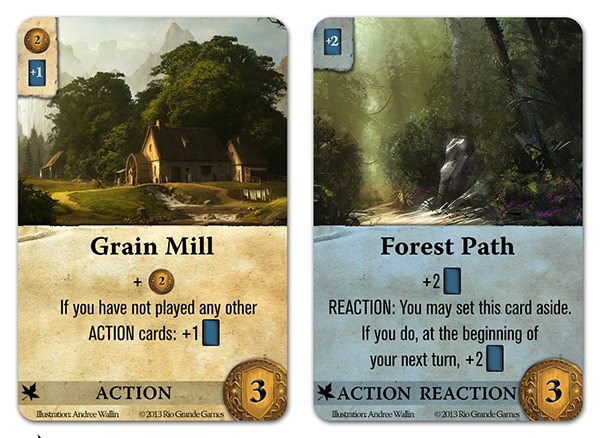 The Action card type is referred to quite a bit in the text of other cards, like my Grain Mill. Plus there are several combination cards: Action – Attack, Action – Treasure, Action – Victory, Action – Prize… That list just goes on. The upper left corner, I want a banner that’s dropped into the artwork instead of the worn paper thing. That’s probably my next step. Also to be redone: replace the card icon with the card back artwork, a slightly different paper effect for the reaction card type, and a slight tweaking of the body font. Illustrations for these come from Andree Wallin, used without permission. Some of Andree’s work can be found at http://andreewallin.deviantart.com/. Coin design taken from the Dominion board game. Great work, I wish you’d worked on a full redesign for them – Dominion is a brilliant game, but the visual design, from the logo, to the icons and actual cards is so unutterably horrible I just can’t bring myself to buy it.